I say, "who needs a microwave?! just get rid of it and you're problem is solved." ok, maybe not BUT...I do like where it's to the left of the sink in an empty cabinet like what you have pictured above (if you can figure out how/where to do that). I'm not crazy about them over the range either but if that's the only option, then that's the only option. It doesn't seem like there's enough room in your kitchen BUT is there enough room to put an island that could have a few drawers and house your microwave? Pinterest has some really cute ideas/layouts of the "coffee bar" like what you're describing. Good luck! Can't wait to see how it turns out! I say no microwave over the range. Completely takes away from the look you are going for. It doesn't look bad how they have it on the side, it just takes away some of your cabinet space. I think that area to the right of the garage door needs to be an extension of the kitchen and look just like the end cabinets on the picture where you showed the range in someone else's kitchen. I love that aqua wall color too, hint hint. The single sink is WAY too small for a family your size. That's my two sense from someone who has never renovated at all! Oh Jaime...were should I begin??? First, I love all your ideas and the look you are going for in the kitchen. Matt & I updated our kitchen 4ish years ago. Our cabinets were in great shape and already white so we didn't even touch those (lucky I know). We did rip up our linoleum floor and install tile, add a dishwasher, butcher block countertops, subway tile back splash and a new sink. I will offer up my advice and opinions based on our experience. If you are considering tile flooring and your house is older (like ours) make sure you pick the right backer board for your sub-floor. If you are thinking of going this route let me know and I can get Matt to give you some more info. I will say that now I wish I would've considered more floor options (like the cork floors on younghouselove). I picked out a Kohler enameled cast iron sink...that I LOVE. It is very similar to the ones you listed. It has been great! I bought the Kohler basket things for the bottom of the sink too. I did NOT pay the listed price for the sink or the baskets! I got the sink from Lowe's ($250ish I think) and ordered the baskets on-line for about $30 each. 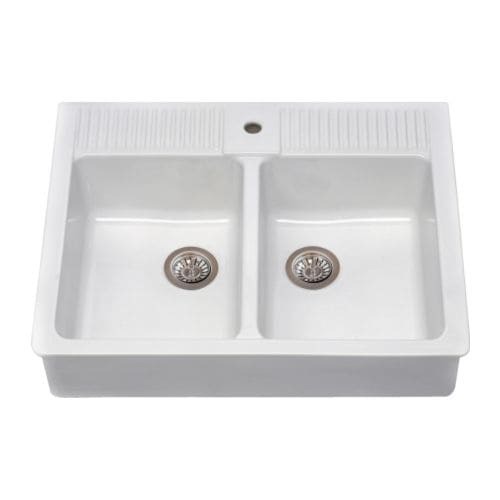 Here are some links so you can read about the smart divide center of the sink. It's genius! 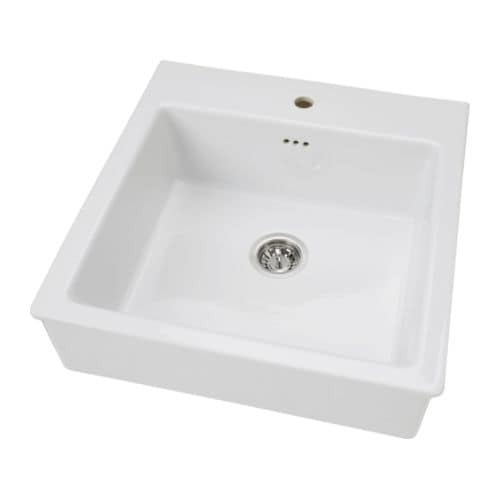 I have 2 sink compartments but fill it with enough water and it becomes one big sink. Next, I LOVE the range you picked!! I hope to upgrade our range soon. We originally installed an over the range microwave...and I hated it. It just looked so heavy. We have a vent hood now and it is so much better. The huge difference is the size of the microwave. The over the range microwave was so ginormous! We sold it and bought a much smaller microwave from Target. I love how the younghouselove people made a microwave cabinet for their normal sized microwave. I think putting it in the pantry area is a good idea if you are more concerned with the cabinet symmetry by the stove. Maybe you could put it on a shelf or something to get it off the counter. Installing the butcher block countertops was easy...once we made sure the measurements were perfect. You and Tim could totally diy this! We bought the Numerar contertop from IKEA and it has done wonderfully. The subway tile backsplash was surprisingly easy and fast (maybe we were still traumatized from the floors?). We still get compliments on it. This was also our first time to tile anything! So if we can do it, I know y'all can!! I hope at least some of this was helpful. You are doing a great job and I am sure it will come together beautifully! How often do you use a microwave? Want to see it all in person and discuss. I love talking and hashing through this stuff. Love all of your ideas, Jaime!! I can't wait to see it all start to come together! Regarding the microwave, I too think it takes away from the range over there. What if you did one 'tower' upper cabinet-like from the counter up-in the corner to conceal the microwave and a few non pretty appliances, and then have the rest of the space to the left open shelving? Or something like that, which might make it look more like a custom piece? Hi! i love the design. Here is what i think: i like the idea of the microwave over the counter and not the stove. I keep thinking about the radiation being so close to your head while cooking lol. i like the flow of cooking on one side and washing on the other. i also like one big sink. meat can always be thawed in smaller container in the sink. i have a BIG pasta/crab pot and its really hard to wash since i have the double sink. ok that's all :-) cant wait to read about the finished product! I'd put a microwave on your coffee-maker area, on the left side. I think you've got plenty of room for it there, still leaving space for cute coffee display. Love your kitchen ideas! I've spent more hours than I can count over the years trying to figure out how make my tiny kitchen work. My pantry cabinet is downstairs in the basement, which is a colossal pain in the neck. Interior designing is a crucial activity that requires innovative ideas and creative mind. My personal experience says overdoing might hamper the beauty of the house. So, keep it simple and sober and it will do wonder.